Download "Disclosure Pursuant to 11 U.S.C. 527(a)(2)"
1 Disclosure Pursuant to 11 U.S.C. 527(a)(2) You are notified: 1. All information that you are required to provide with a petition and thereafter during a case under the Bankruptcy Code is required to be complete, accurate, and truthful. 2. All assets and all liabilities are required to be completely and accurately disclosed in the documents filed to commence the case. 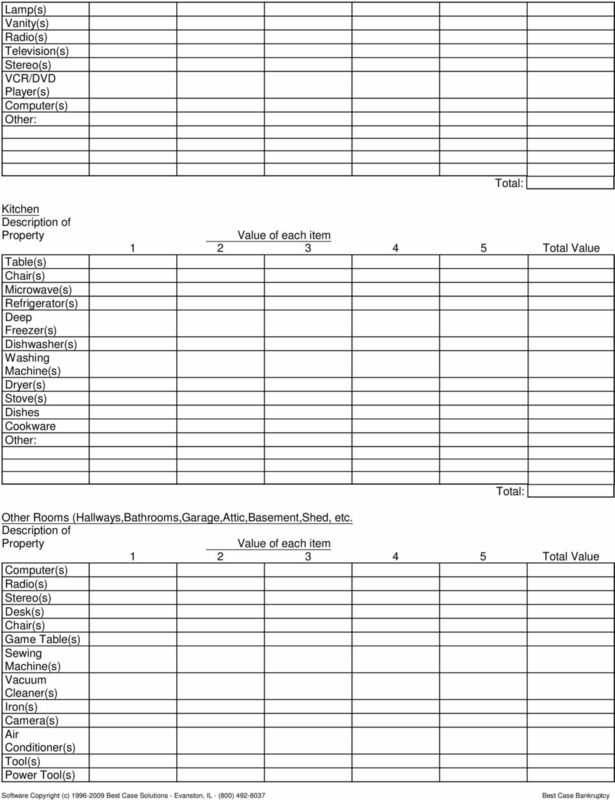 Some places in the Bankruptcy Code require that you list the replacement value of each asset. This must be the replacement value of the property at the date of filing the petition, without deducting for costs of sale or marketing, established after a reasonable inquiry. 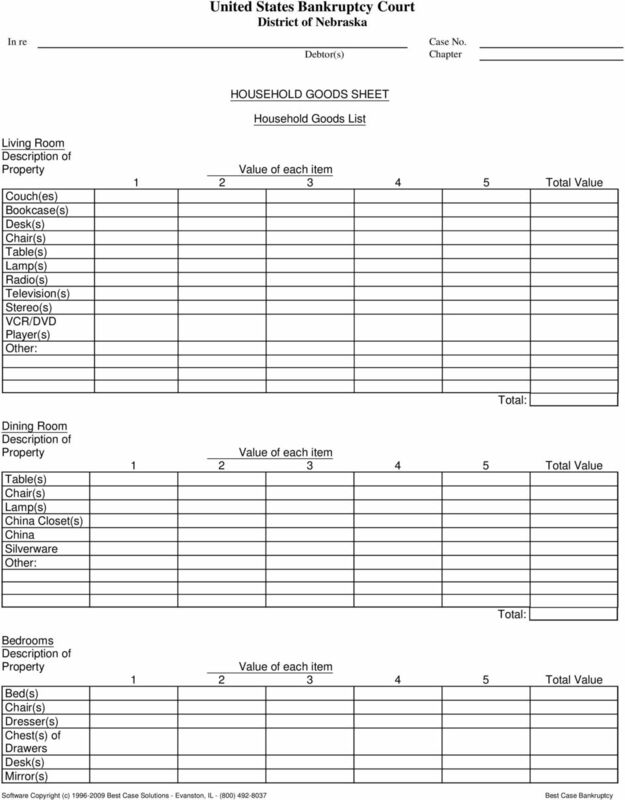 For property acquired for personal, family, or household use, replacement value means the price a retail merchant would charge for property of that kind, considering the age and condition of the property. 3. 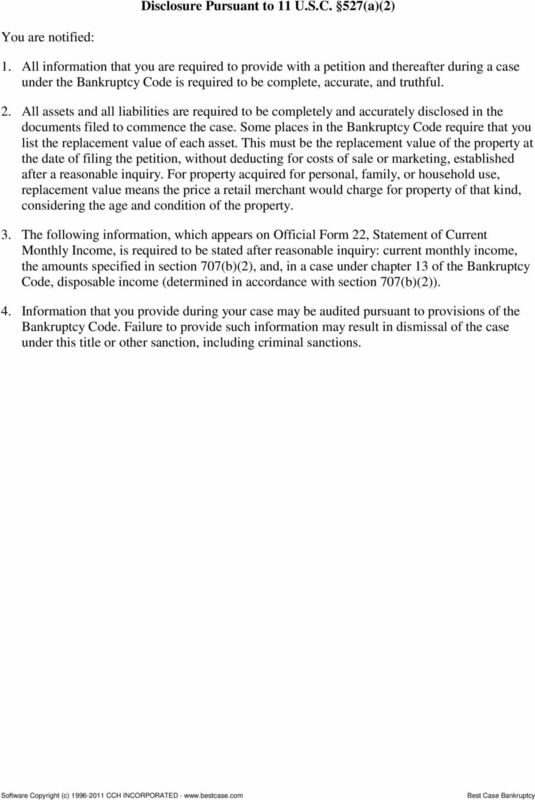 The following information, which appears on Official Form 22, Statement of Current Monthly Income, is required to be stated after reasonable inquiry: current monthly income, the amounts specified in section 707(b)(2), and, in a case under chapter 13 of the Bankruptcy Code, disposable income (determined in accordance with section 707(b)(2)). 4. Information that you provide during your case may be audited pursuant to provisions of the Bankruptcy Code. Failure to provide such information may result in dismissal of the case under this title or other sanction, including criminal sanctions. 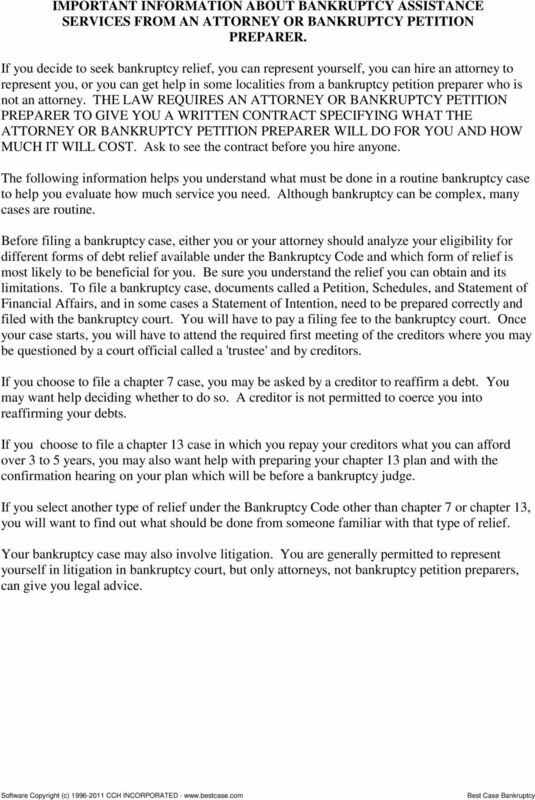 2 IMPORTANT INFORMATION ABOUT BANKRUPTCY ASSISTANCE SERVICES FROM AN ATTORNEY OR BANKRUPTCY PETITION PREPARER. If you decide to seek bankruptcy relief, you can represent yourself, you can hire an attorney to represent you, or you can get help in some localities from a bankruptcy petition preparer who is not an attorney. THE LAW REQUIRES AN ATTORNEY OR BANKRUPTCY PETITION PREPARER TO GIVE YOU A WRITTEN CONTRACT SPECIFYING WHAT THE ATTORNEY OR BANKRUPTCY PETITION PREPARER WILL DO FOR YOU AND HOW MUCH IT WILL COST. Ask to see the contract before you hire anyone. 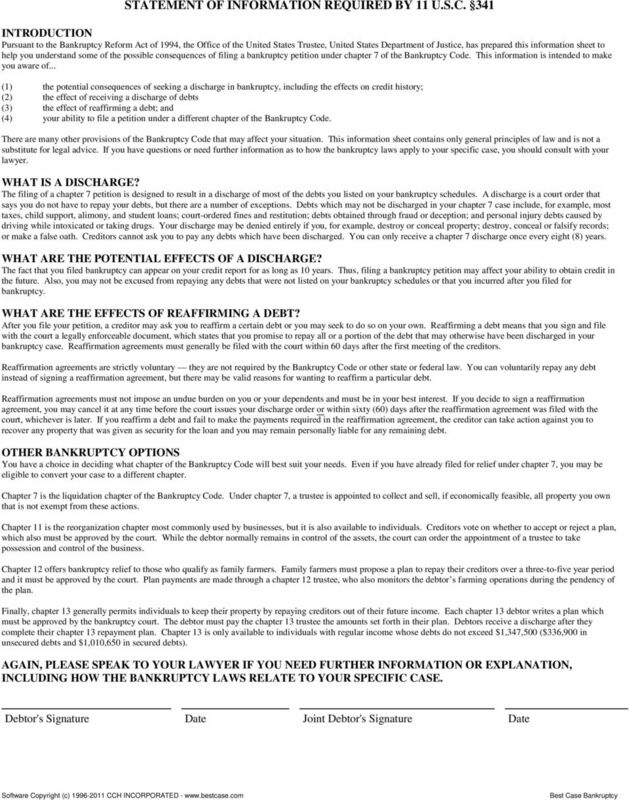 The following information helps you understand what must be done in a routine bankruptcy case to help you evaluate how much service you need. Although bankruptcy can be complex, many cases are routine. Before filing a bankruptcy case, either you or your attorney should analyze your eligibility for different forms of debt relief available under the Bankruptcy Code and which form of relief is most likely to be beneficial for you. Be sure you understand the relief you can obtain and its limitations. To file a bankruptcy case, documents called a Petition, Schedules, and Statement of Financial Affairs, and in some cases a Statement of Intention, need to be prepared correctly and filed with the bankruptcy court. You will have to pay a filing fee to the bankruptcy court. Once your case starts, you will have to attend the required first meeting of the creditors where you may be questioned by a court official called a 'trustee' and by creditors. If you choose to file a chapter 7 case, you may be asked by a creditor to reaffirm a debt. You may want help deciding whether to do so. A creditor is not permitted to coerce you into reaffirming your debts. If you choose to file a chapter 13 case in which you repay your creditors what you can afford over 3 to 5 years, you may also want help with preparing your chapter 13 plan and with the confirmation hearing on your plan which will be before a bankruptcy judge. If you select another type of relief under the Bankruptcy Code other than chapter 7 or chapter 13, you will want to find out what should be done from someone familiar with that type of relief. Your bankruptcy case may also involve litigation. You are generally permitted to represent yourself in litigation in bankruptcy court, but only attorneys, not bankruptcy petition preparers, can give you legal advice. 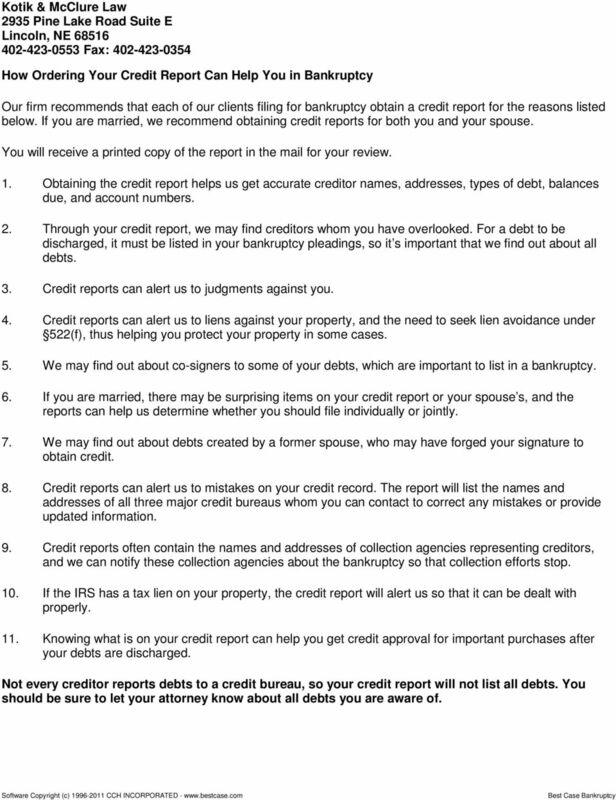 6 Kotik & McClure Law 2935 Pine Lake Road Suite E Lincoln, NE Fax: How Ordering Your Credit Report Can Help You in Bankruptcy Our firm recommends that each of our clients filing for bankruptcy obtain a credit report for the reasons listed below. If you are married, we recommend obtaining credit reports for both you and your spouse. 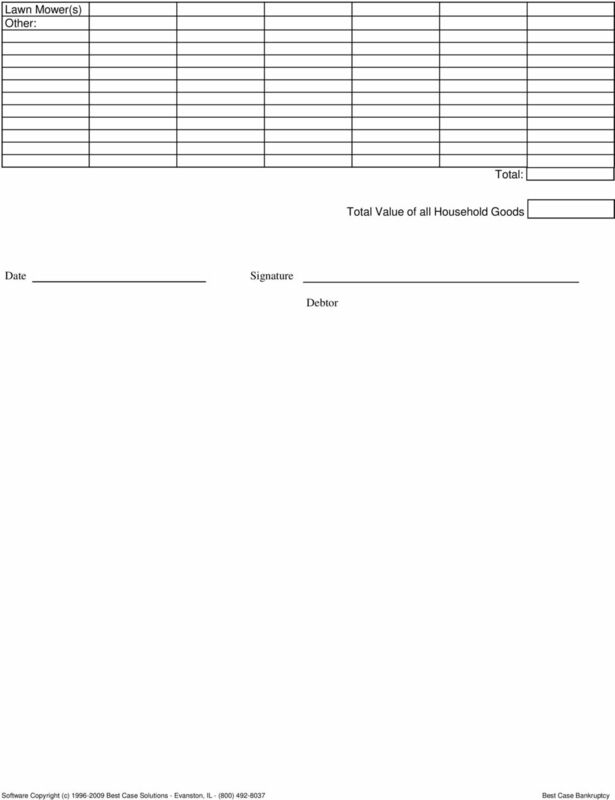 You will receive a printed copy of the report in the mail for your review. 1. Obtaining the credit report helps us get accurate creditor names, addresses, types of debt, balances due, and account numbers. 2. Through your credit report, we may find creditors whom you have overlooked. For a debt to be discharged, it must be listed in your bankruptcy pleadings, so it s important that we find out about all debts. 3. Credit reports can alert us to judgments against you. 4. Credit reports can alert us to liens against your property, and the need to seek lien avoidance under 522(f), thus helping you protect your property in some cases. 5. We may find out about co-signers to some of your debts, which are important to list in a bankruptcy. 6. If you are married, there may be surprising items on your credit report or your spouse s, and the reports can help us determine whether you should file individually or jointly. 7. We may find out about debts created by a former spouse, who may have forged your signature to obtain credit. 8. Credit reports can alert us to mistakes on your credit record. The report will list the names and addresses of all three major credit bureaus whom you can contact to correct any mistakes or provide updated information. 9. Credit reports often contain the names and addresses of collection agencies representing creditors, and we can notify these collection agencies about the bankruptcy so that collection efforts stop. 10. If the IRS has a tax lien on your property, the credit report will alert us so that it can be dealt with properly. 11. Knowing what is on your credit report can help you get credit approval for important purchases after your debts are discharged. Not every creditor reports debts to a credit bureau, so your credit report will not list all debts. You should be sure to let your attorney know about all debts you are aware of.